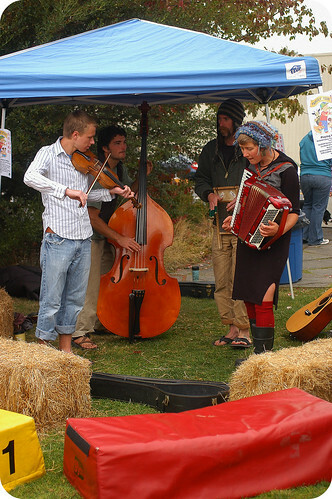 Last weekend, on the island, there was an apple cider festival. Of course, there was cider, pressed from island apples by island folks, by the glass, the jug, and the barrel. Sweet and mellow, with just a hint of tartness  the cider spoke of autumn. But the main event, in tents off the Saturday farmers’ market, was the apple demonstration. 70 different kinds of apples. 70! 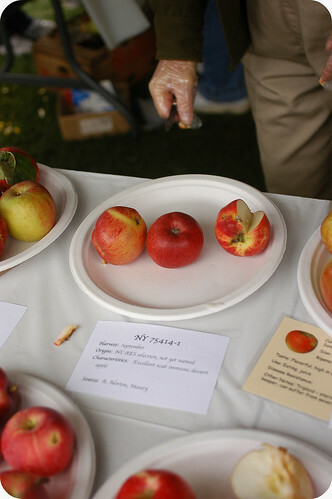 Heirlooms, common varieties, and even apples so new they didn’t have names yet. We were a bit daunted. How would we taste them all? 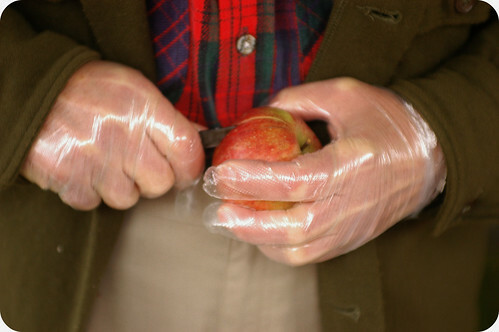 Each apple had a name, a type, and a sharp knife by it, in case you wanted to taste it. I love that they carved the name of this one into the apple. 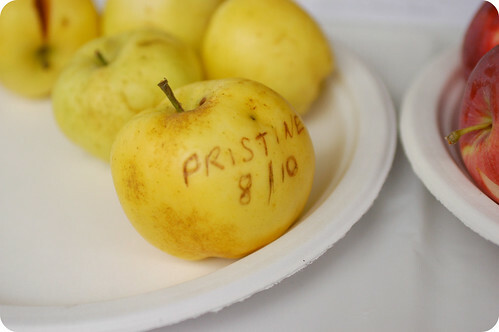 This Pristine apple appears in early August, far before most other apples. All the apples were sliced and offered by members of the island’s fruit club. A fruit club! They gather together to discuss pruning and grafting, and then have potlucks afterwards. We’re going to join soon. I had never seen a Holstein in a market before. It’s grown through grafting, apparently. But it’s wonderful. It tastes like finished cider, instead of the raw fruit. I love that sometimes the best apples have worm holes in them. These probably wouldn’t sell in the grocery store. And this apple, wonderful for dessert on its own, is so new that it doesn’t have a name yet. Dr. Bob Norton, who runs the island fruit club, created them his orchards. I wish we could have stayed for hours and sampled another 20 kinds of apples. Just off the apple tents was a space for the toddlers. And this band. This is such an island band. And parading through it all, a man and his chicken. 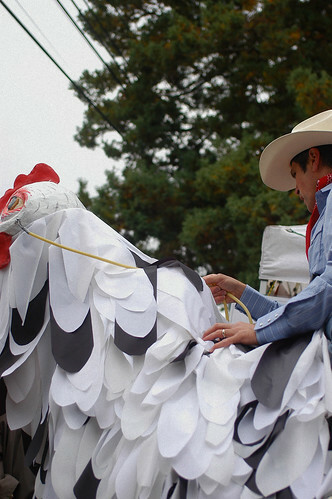 What, you’ve never seen a man riding a giant chicken? SWEET! Eccentric, lively, lovely, home. Those "worm holes" are spots on the fruit from moisture. The plant has to deal with "extra" rain somehow. Cherries & tomatoes split apart, apples get spotty little holes in them. Now you know. I love giant chickens, too. I hope you enjoy yr weekend! Oh how I miss that area. What a wonderful weekend. Thank you for taking me down memory lane! What a wonderful place to live and raise your daughter….!! I never knew so many types of apples existed…would love to try them all myself. I am truly enjoying your frequent posting of late…I love to read your words! Have a beautiful weekend! Thank goodness for Johnny Appleseed and all the apple seeds he planted all over our country. Wait, was that a myth or true? It is time for me to go apple picking with the kids and make a good apple cake with them. Or is it too late, and I have to go pumpkin picking instead? I LIKE that islant you live on. I love reading about it. I remember once you talked about the community cookbooks being a treasure trove of recipes. If there is one for Vashon, I will order it. Happy Saturday to you and yours. Apples, the perfect fruit. Love how many varieties there are, the array of flavors is so broad. Have you ever seen a pink pearl? They are smallish with a green blush but when you cut into them, the flesh is pink! Make the most amazing applesauce. I beg to differ about the "worm holes." I've personally witnessed Flickers and Pileated Woodpeckers pecking away at our apples. They love them as much as we do. Our apples don't have any worms, but occasionally a family of earwigs (lovely) will move into the little "cave" on the blossom end. We just rub the apple on the grass and the earwigs move out. Thanks for the visit to your island! We used to go to Conklin Orchards and get cider fresh pressed all through the fall- it was free- all you could drink- while you were shopping for apples and pies, etc. They taught us about Johnny Appleseed in school, and he was definitely a real person, though I can't remember if we learned his real last name. As I read and looked at your pictures I could almost smell the apples. That must have been so fun to attend and try so many different varieties. Great post! Just a quick apple growing note, apples do NOT sprout true from seed. Virtually all apples commercially available, from growers large and small, are grown from grafts. Apple trees grown from seed rarely produce something worth eating. Apples were grown way back when not to eat, but to make cider out of. Michael Pollan's "The Botany of Desire" covers the apple, as well as the legend and legacy of Johnny Appleseed. Great stuff! And if you can get PBS, there is a 2 hour documentary in production, based on the book. Supposed to air the end of October. This festival would be like a trip to heaven for me. I am totally obsessed with apples! We got so much rain in the northeast in June, so some varieties have brown spots due to a calcium deficiency. No bother! I just roast them or bake them! DELICIOUS. BTW, we ALSO went to La Boucherie Friday night and it was fanTAStic. I told the guy (Matt?) that we came because I read your blog and your husband guest-chefed. He said, "Oh, Dan! I love it when that happens!" The food was lovely, lovely, wonderful, lovely and THEN he put together a breakfast bag for us for our stay. Thank you for the referral! It was the highlight of our trip. Oh, and a fruit club? How wonderful! Beautiful photos of colorful fall apples. I'm about to eat one right now. apple festival are great! such fall fun! 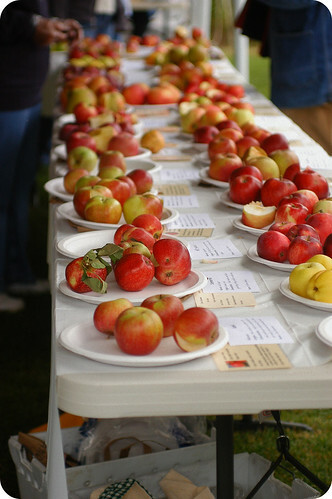 here's another apple festival on an island close by – saltspring island…with 300 varieties of apples & some real apple nuts! I can tell you how to make apple cider vinegar in three words: Loosen the lid. That's all. Then just wait (weeks) until it's complex and aromatic and lovely, a little trip through the cheesecloth and into a CLEAN bottle. your photos are SO LOVELY. i especially love your chicken banner. Really very gorgeous! I've been very focused on pumpkins lately, but apples are a great fall food too. I love the picture will all the apples on the table. I didn't realize you were on Vashon – what a small world! My stepbrother and sister-in-law live on Hogsback Farm. We visited last year for their wedding – truly one of the most beautiful places I have ever been. And the farmers' market is so, so lovely. 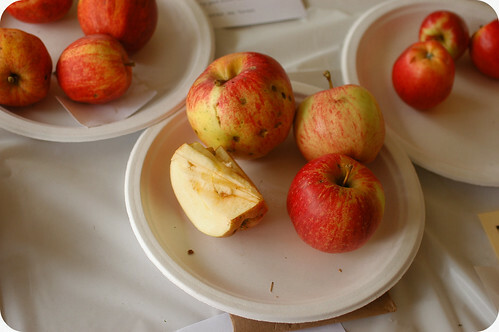 The cider fest was a hoot and the variety of apples was surprising. One that was apparently 'created' on Vashon that knocked my socks off (and hopefully I remembered correctly) was "glowing embers." As far as worm holes go, you have a couple culprits: coddling moth, goes up through the bottom blossom and eats the seeds (not so bad; it's the apple maggot that does the real damage and plunges right through the meat of the apple and riddles it bitter and useless. Correction, makes it a delectable treat for your chickens or in my case, English Bulldogs. Nice post — thanks! Hi, I love the photos! Oh my I am so in Apple mode right now. Yum! 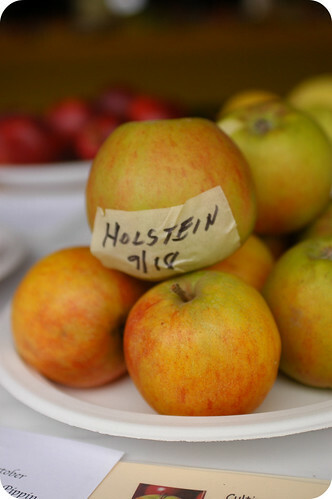 I planted a Holstein Apple tree last spring, I hope I get to taste at least one this year!